All fuel leading parts of a residential heating system have to be compatible with Fast Pyrolysis Bio-oil (FPBO). 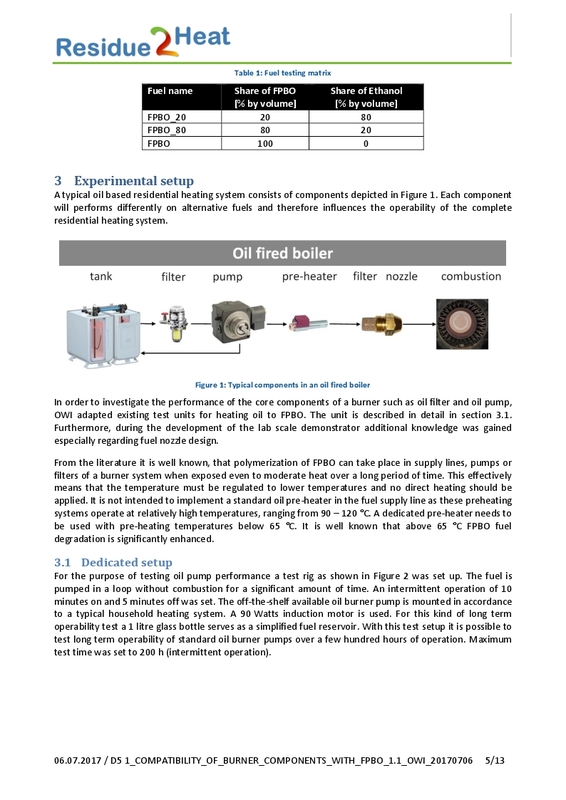 In scope of Task 5.1 standard burner components used in residential heating appliances have been tested in terms of long term operability with FPBO. For this report oil burner pumps are in the main focus of the investigation using a dedicated test setup. Due to physical and chemical properties of FPBO, deposit formation in fuel leading parts is probably unavoidable. Deposit formation has been observed in several setups, in order to minimize the negative effects of deposit formation, (particle) filters were removed from the fuel supply line. For future fuel optimization it is therefore suggested to lower the concentration of solid particles and additionally limit particle size diameters to make the fuel filters more or less superfluous. Additional tests will be promoted in order to identify not only specific fuel components (or group of substances), which cause filter coating, but also burner components which ensure a long-term operability of FPBO. Intermittent operation as it is typical in domestic heating applications using standard fuel pumps will be difficult to realize. During turn-off time sticky deposits settle at inner parts of the pump (e.g. gears) and can prevent a restart. The longer the turn-off time the less likely the pump will be able to restart. Alternative solutions should be investigated. As observed during the test procedures wear and corrosion occur. However, these effects appear to be of minor concern at the present state of development. Nevertheless, reduction of acid and water content in the fuel would be beneficiary with respect to pump life time. The present investigations have shown that special measures have to be taken for the domestic use of FPBO in residential heating systems, with respect to combustion appliances. This expectable fact requires a corresponding further development of the system components for FPBO combustion boilers. This entry was posted in Deliverables, General and tagged burner, burner components, FPBO, Pyrolysis, Roy Hermanns, Sebastian Feldhoff. Bookmark the permalink.